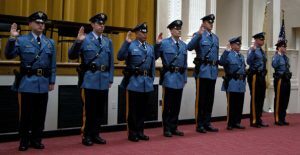 On Tuesday evening, April 29th the Palisades Interstate Parkway Police Department had the pleasure of swearing in two new command staff personnel as well as eight new members to the patrol division. Detective Sergeant Roman Galloza was officially sworn in as Detective Lieutenant. 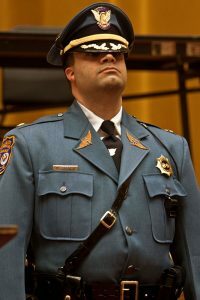 Lieutenant Michael Coppola was officially sworn in as Chief of Police after assuming an Acting Chief title for over a year. Of the eight members of patrol, two were still in the police academy and scheduled to graduate in early summer. The new officers will replace those who either retired after years of service to the Palisades Parkway or transferred to municipal agencies. A ninth new member, Robert Littlejohn, Jr was sworn in on an alternate date as he was injured earlier in the day on training.